"Man, when your guests bite into these at the Memorial Day cookout, they'll savor meat so tender and juicy that it slides right off the bone and gets you the respect you deserve! I have found that the major restaurant chains who make this awesome dish pre-cook their ribs SLOWLY before the quick grilling process." Cut each full rack of ribs in half, so that you have 4 half racks. Sprinkle salt and pepper (more pepper than salt), and 1 tablespoon chile pepper over meat. Wrap each half rack in aluminum foil. Bake for 2 1/2 hours. Meanwhile, heat oil in a medium saucepan over medium heat. Cook and stir the onions in oil for 5 minutes. Stir in water, tomato paste, vinegar, brown sugar, honey, and Worcestershire sauce. Season with 2 teaspoons salt, 1/4 teaspoon black pepper, liquid smoke, whiskey, garlic powder, paprika, onion powder, dark molasses, and 1/2 tablespoon ground chile pepper. Bring mixture to a boil, then reduce heat. Simmer for 1 1/4 hours, uncovered, or until sauce thickens. Remove from heat, and set sauce aside. Discover the secret to impossibly tender, fall-off-the-bone BBQ ribs. Artificially flavoring with liquid smoke is never a good idea. I won't make these again. This is one of the best sauces I have ever made. 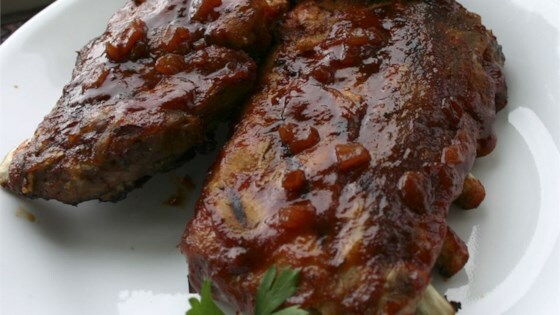 To anyone who knows ribs, this is one of the best barbeque recipes you can get, hands down. These were the BEST ribs I have ever made. The sauce was very tasty, although it took much longer than 1 1/4 hours to reduce. Great recipe, and one that I will make again. Unbelievable!! I made ribs for 8 people and everyone ranted and raved the whole dinner - hands down the best ribs we had ever eaten in our entire lives. WOW.